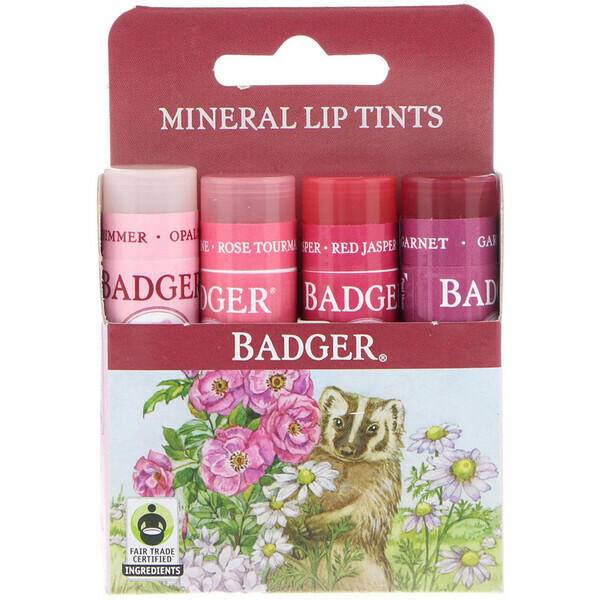 Badger Mineral Lip Tints protect and nourish, leaving lips soft and naturally beautiful. With the delicate fragrance of Rose and Vanilla organic essential oils. A hint of color. A lot of gorgeous, creamy and smooth with a delicate fire-red hue, Red Jasper natural mineral lip tint protects and nourishes, leaving lips soft and beautiful. One swipe delivers a sheer touch of color, or apply liberally for increased intensity. Great in a pinch for adding a bit of color to your cheeks and under the brow bone. 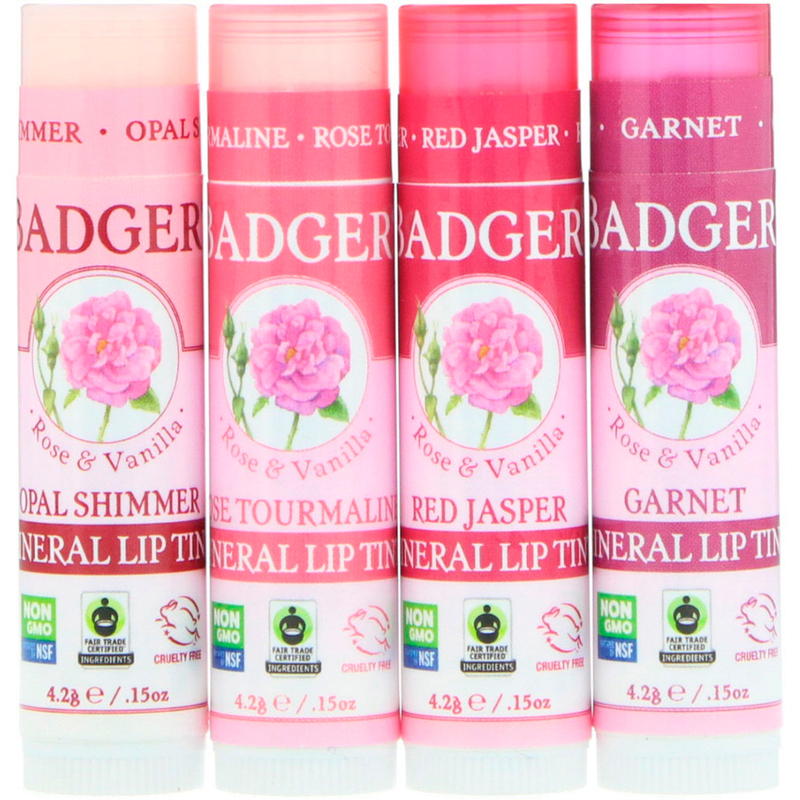 Subtle aroma of Rose and Vanilla plus the naturally heavenly scent of Shea and Cocoa Butter will make it your new go-to everyday lip balm. 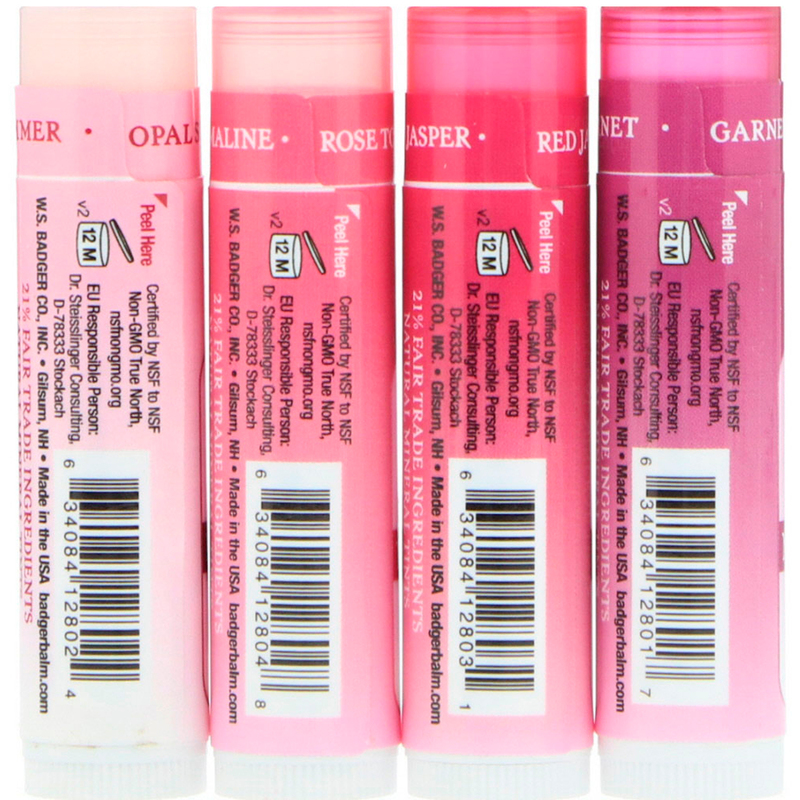 Apply to lip as desired. Opal shimmer: *Cera alba (beeswax), *ricinus communis (castor) seed oil, *helianthus annuus (sunflower) seed oil, *◊olea europaea (olive) fruit oil, *†cocos nucifera (coconut) oil, *†theobroma cacao (cocoa) seed butter, *butyrospermum parkii (shea) butter, mica, *copernicia cerifera (carnauba) wax, *aloe barbadensis (aloe) leaf extract, titanium dioxide (and) silica (and) jojoba esters, iron oxides, tocopherol (sunflower vitamin E), *rosa canina (rosehip) fruit extract, *hippophae rhamnoides (seabuckthorn) fruit extract, *rosa damascena (rose) flower oil, *vanilla planifolia (vanilla) fruit extract. Organic essential oils contain >0.001% citronellol, geraniol, eugenol, farnesol. Rose tourmaline: *Cera alba (beeswax), *ricinus communis (castor) seed oil, *helianthus annuus (sunflower) seed oil, *◊olea europaea (olive) fruit oil, *†cocos nucifera (coconut) oil, *†theobroma cacao (cocoa) seed butter, *butyrospermum parkii (shea) butter, iron oxides, mica, *copernicia cerifera (carnauba) wax, *aloe barbadensis (aloe) leaf extract, titanium dioxide (and) silica (and) jojoba esters, tocopherol (sunflower vitamin E), *rosa canina (rosehip) fruit extract, *hippophae rhamnoides (seabuckthorn) fruit extract, *rosa damascena (rose) flower oil, *vanilla planifolia (vanilla) fruit extract. Organic essential oils contain >0.001% citronellol, geraniol, eugenol, farnesol. Red jasper: *Cera alba (beeswax), *ricinus communis (castor) seed oil, *helianthus annuus (sunflower) seed oil, *◊olea europaea (olive) fruit oil, *†cocos nucifera (coconut) oil, *†theobroma cacao (cocoa) seed butter, *butyrospermum parkii (shea) butter, mica, iron oxides, *copernicia cerifera (carnauba) wax, *aloe barbadensis (aloe) leaf extract, tocopherol (sunflower vitamin E), *rosa canina (rosehip) fruit extract, *hippophae rhamnoides (seabuckthorn) fruit extract, *rosa damascena (rose) flower oil, *vanilla planifolia (vanilla) fruit extract. Garnet: *Cera alba (beeswax), *ricinus communis (castor) seed oil, *helianthus annuus (sunflower) seed oil, *◊olea europaea (olive) fruit oil, *†cocos nucifera (coconut) oil, *†theobroma cacao (cocoa) seed butter, *butyrospermum parkii (shea) butter, mica, iron oxides, *copernicia cerifera (carnauba) wax, *aloe barbadensis (aloe) leaf extract, tocopherol (sunflower vitamin E), *rosa canina (rosehip) fruit extract, *hippophae rhamnoides (seabuckthorn) fruit extract, *rosa damascena (rose) flower oil, *vanilla planifolia (vanilla) fruit extract. Organic essential oils contain >0.001% citronellol, geraniol, eugenol, farnesol.